Qetesh is a goddess of Semetic origin. She was worshipped as a nature goddess, and a goddess of sacred ecstasy and sexual pleasure. Her cult became popular in Egypt during the New Kingdom. Qetesh's sexuality led to a natural association with the Egyptian goddess Hathor. In early portrayals she is shown as a naked woman standing upon a lion. On her head is the cresent moon and disk. Later interpretations show Qetesh again on the lion, but with the headdress of Hathor, wearing a deep necklace and a tight-fitting dress which extends to her ankles. Her hands hold symbols of eroticism and fertility. In her right hand she holds lotus flowers and in her left, two snakes. Like Bes (and contrary to Egyptian artistic convention), Qetesh is always pictured full-face. 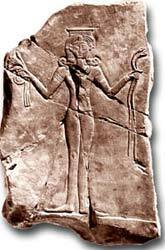 Qetesh was part of a triad with the child, Min, and her husband, Reshep (who, like her, was another foreign god).